Giorgio da Castelfranco (1478 ca - 1510), famous as Giorgione, is one of the most important exponents of the Venetian painting school, despite having worked for only ten years. The figure of Giorgione is wrapped in a mystery: his works have not been signed, so the attribution to him is not always certain. Above all, the interpretation of his paintings is often enigmatic. It still gives rise to debates among art scholars. However, art historians agree that Giorgione gave a fundamental contribution to the foundation of Mannerism. We know little about his life. We know for sure that he worked in Venice, where he worked in Giovanni Bellini′s workshop. Later, he probably attended the court of Caterina Cornaro, the dethroned queen of Cyprus, in Asolo. From some written testimonies, we know that private buyers Giorgione\'s works, and they asked the master to put a complex symbology in his paintings. Giorgione meditated for a long time on his work, and enriched it with multiple meanings. For this reason, today it is so difficult to interpret his paintings. 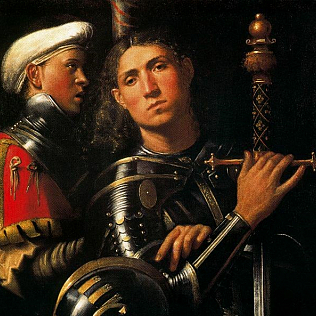 The room 75 of the Uffizi Gallery is dedicated to Giorgione and Sebastiano del Piombo. Here we can admire two little oil on panels by the master: the The Test of Fire of Moses and The Judgement of Solomon. The two works form a pair, as we can infer from the similar compositional structures of the scenes. Another painting attributed to Giorgione is hosted in the room. It is the Portrait of Warrior with his Equerry. According to art historians, the painting was made by the artist in the last years of his career.